Well, I guess I don't see any difference between the Docs beads and propellers and a single bead. The regulation text says "fixed" it doesn't say it has to be threaded, or that it has to be just a bead. it says "An attractor, including a bead", to me that leaves it open to anything, and/or a bead. The way I read it, it's referring to anything that would attract a fish and it has to be within two inches of the hook. Like they were dividing the lure into it's components, the attractor, and the hook. Your point about the flasher is a good one. There can be no doubt that it is an attractor, it is there to attract a fish. Somebody above quoted the definition of "attractor". To me, the 2" rule would make the flasher not legal. I'm not saying, I think the flasher should be illegal, I'm saying that the 2 inch rule is in conflict with the use of a flasher. ARTIFICIAL LURE—any lure which is man-made, free ofbait as defined in 5 AAC 75.995, and is used to attract fish.This includes an artificial fly. There's no breakdown of components. It's my belief that the attractor 2" rule is meant to cover two main components (although i'm sure others apply); beads, and tube flies. The 2" rule was not meant to apply to plugs, spoons, or standard flies. "The North wind is cold no matter what direction it's blowing"
I'm not sure how you came to that conclusion. It doesn't say anywhere what it was meant to include, and that is part of the problem as I see it. It seems to me it would be a stretch to call a bead an attractor and call a bead with a propeller something else. If a flashy thing that doesn't have a hook attached to it is not an attractor, what should we call it? It's not a lure, to me a lure has a hook. It is my understanding that the 2" rule is specifically for the bead trout fishery. I don't believe it pertains to all fisheries. Where 2 hooks are legal, it is my understanding that there is no distance restrictions. It is quite common to use trailer hooks in the saltwater salmon fisheries that are more than 2" separation. I'm not sure how you came to understand that. The regulation isn't written under species specific headings. The Docs method would have a very high probability of being fished for kings in the very same waters that beads would be fished for trout and dollies, and at the same time. There are no regulations other than the two inch rule that distinguish an attractor or bead from the Docs rig. 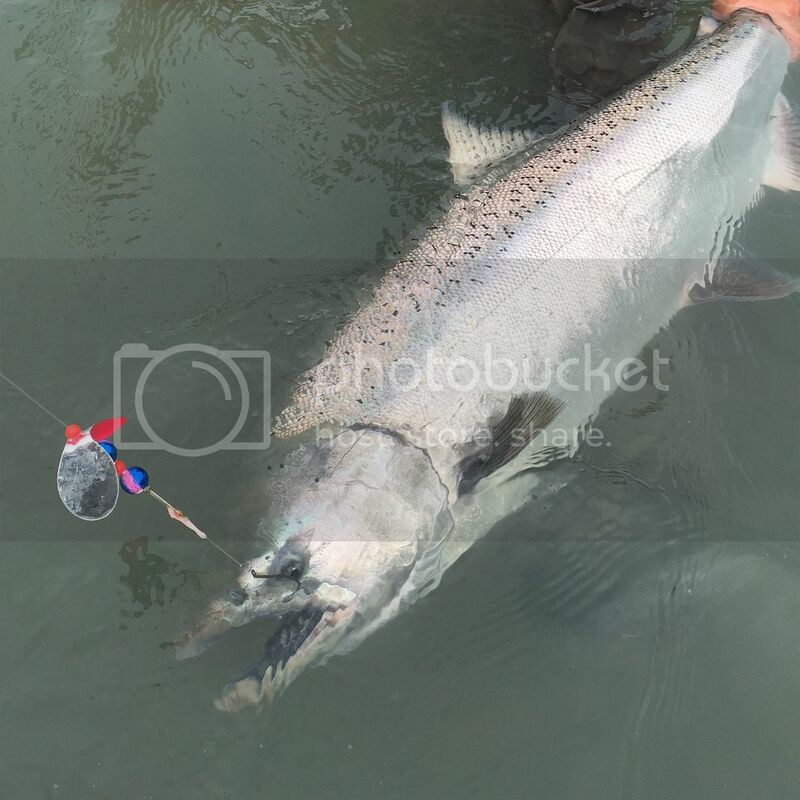 It's quite possible that someone fishing for kings in the Kenai, or any other river for that mater, with the Docs rig to catch a Rainbow, steelhead or dollie. I am quite sure that it would be illegal under the 2 inch rule. I wouldn't want to be caught fishing that way. Seems you'd have some "splanin" to do. You might be right where two hooks are legal, I don't think we are talking about that though. I tie flies with stinger hooks and certainly use lures with stinger hooks. I don't think the Docs methods can be confused with that, to me they are very different. It can be argued that the stinger hooks I am referring to are a part of the lure or fly, not so with the Docs method. You're probably right on the bead and propeller in doc's rigs being attractors, although those are probably able to slide the entirety of the leader/line making them legal for use. I'm referring to the plug with hook connected by a bead chain; no attractor on those bad boys. When using a double hook set up, I know I've never read how far the trailing hook had to be. Doc's method is so different than the "bead/2" rule" that it probably never came up as a consideration of legality or not? It is my understanding that the 2" rule is specifically for the bead trout fishery. I don't believe it pertains to all fisheries. It went Statewide for all fresh waters as supported by ADFG and adopted by the BOF in 2003. At this time they also added "bare hook" to the regulation. It was proposal 26. "Beads fished at a distance from the hook are purported to increase the incidence of “foul-hooking.” Regulations concerning attractors, or beads, were first adopted for the Bristol Bay and Kenai River freshwater areas in 1997 and 1998. The purpose of these regulations was to prevent fixing beads more than two inches from the hook so that the incidence of ‘foul-hooking’ fish would be minimized. However, the original regulations did not state that beads had to be free-sliding along the entire line, which prompted some anglers to tie a knot or place a stopping device at a distance from the hook and place the bead above the knot. In 2002, the Board modified the original regulations to their current form to address this problem. At that time, the regulations were standardized across areas and expanded to all fresh waters of the Kenai Peninsula, Susitna-West Cook Inlet, and Bristol Bay Areas." applied to anglers fishing with bare hooks, in addition to anglers fishing with lures or flies." Clearly, and since there was no free-sliding rule, ADFG felt fishermen were using stopping devices to place their attractor too far from the hook, causing increased snagging. So they adopted the 2" - free sliding rule. It is strikingly obvious that Doc is using an attractor fixed on the line/leader approximately 8-10" (or more) from a bare hook. That attractor is not free to slide the entire length of the leader. Even if one could say he's not using an attractor, he is still using a bead. Personally, I think Doc's rig is exactly what the regulation is trying to stop. Those of us who have used them know the length of the hangback is directly attributed to increasing "foul hooking" - what ADFG says, and what some of us have been saying here all along. You're probably right on the bead and propeller in doc's rigs being attractors, although those are probably able to slide the entirety of the leader/line making them legal for use. Clearly the attractor is fixed well above the bare hook UNABLE to slide freely on the entirety of the leader/line. Yep, that's what I have been saying too. I agree with you on this, I do not agree with you when you say the hook has to be inside the mouth if you mean the entire hook has to be inside the mouth. Otherwise, there would be no 2 inch rule, the been would have to be at the hook. They also would not allow "flossing" or a single stinger hook. At one point you seemed to agree that if a portion of the hook was inside the fishes mouth when he was hooked, that was legal. 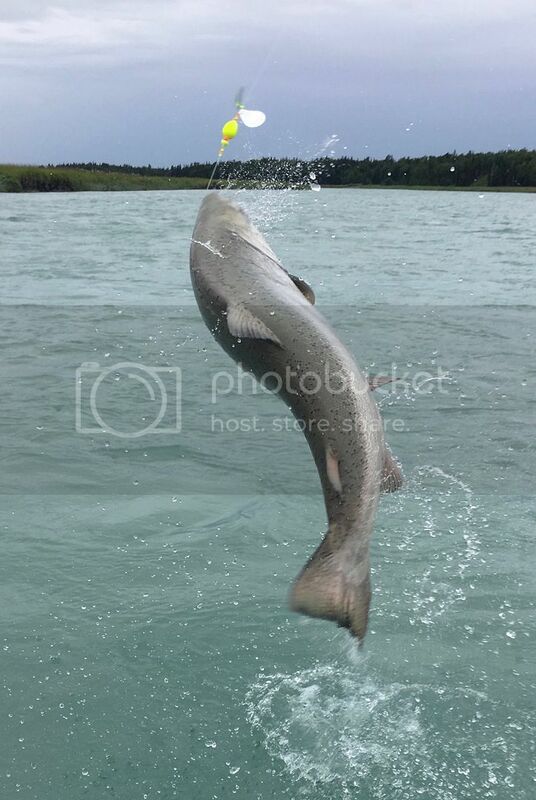 In the Docs pictures it looks to me like at least a portion of the hook was inside the fishes mouth when it was hooked. To me, that makes the hooks location (on the fish) legal, but the rig is not legal because of the 2 inch rule. Do we agree? No, in the Docs rigs, the beads and propellers are fixed 8 to 10 inches above the hook. I find no problem with the kwickfish and the beaded chain, in the examples I know of, the hook is within 2 inches of the lure. mark knapp brought up a good point about Doc's attractors being pegged more than 2" from the bare hook. We are discussing that. You got anything to contribute? The snagging issue hasn't been won or lost. Nobody has proven that the fish in Doc's pics are hooked "in the mouth." The intent of what that means remains conflicting and aloof, even from various LEO authorities. In fact, last I checked Doc was suggesting ways to change the statute wording, avoiding simple questions, and he even claimed "in the mouth" was "outside the mouth" - not things a winning argument should have to do. Again, you got anything to contribute? Nobody has proven that the fish in Doc's pics are not hooked "in the mouth." Having read the whole thread, I feel like I'm up to speed and I have an opinion that is no worse than yours. I know snagging when I see it and I know a plug isn't made to slide on a leader. The silver bead chain is obviously part of the plug and is no different than a jointed stickbait. I see no evidence of the whirly things being pegged either. As I said before, the argument was changed midstream and now the gear is under attack rather than where the hook contacts the fish. I don't recall ever saying the entire hook has to be inside the mouth? For the record, I'm ok with the fish being hooked "in the mouth" by any part of the hook. The 2" rule makes no mention or assumption of where the hook goes. I presume it relies on the snagging definition 5 AAC 75.022 "in the mouth" for that. Additionally, there is some background discussion on this regulation by the ADFG staff that says, "beads fished at a distance from the hook are purported to increase the incidence of “foul-hooking.” I assume "foul hooking" means a snagged fish. So clearly they are aware fish will get snagged. As for flossing, I believe the fish is still considered snagged if it is hooked elsewhere than "in the mouth." I'm not sure of the 2" rule on the rig itself yet. But when I couple it with the method Doc is using - placing the hook well outside the mouth, flossing the line, and pinning the hook elsewhere than in the mouth, I conclude it is snagging. I'd feel better if the fish was actually taking the hook, rather than the opposite. I have to disagree with you that Doc's fish are hooked "in the mouth." They might be hooked outside the mouth, by the mouth, near the mouth, on the mandible, on the maxilla, etc., but they are not "in the mouth." Unlike a maxilla or mandible, a mouth has an opening, where in is not out. If you could, take your two hands and close the mouths of Doc's fish. What's in and what's out. Forget that I was told by the head-honcho LEO that the intent of the statute was the fish must bite or take the hook and be hooked inside the mouth. Read all the other Pacific Coast state's regulations (I already posted them) - they too say this is illegal. Difference being I'm not the one peddling that it's legal - not in a magazine, not on multiple internet sites, not by plastering my photos, or any other creative justification I can whip up. If me making folks aware of the legality issue here bothers you, I understand. Remember, in Doc's last post he said, "keeping the hook out of the mouth is the entire point of rigging hangback." iofthetaiga, if you're from the camp where "out of the mouth" means "in the mouth", then I wish you the best of luck. Difference being I'm not the one peddling that it's legal... iofthetaiga, if you're from the camp where "out of the mouth" means "in the mouth", then I wish you the best of luck. No, you're the one peddling that it's illegal, and the way our laws work is that things are legal unless prohibited by law, and the burden is on the accuser to show where the law prohibits the activity in question. You have not shown that it's illegal. The wording of the statute does not support your allegation. The statute says a salmon must be hooked in the mouth. The mouth of a salmon consists of the maxilla, pre maxilla, dentury, hoid arch, mandibular arch. Doc's photos show fish hooked in these mouthparts. If you believe you can prove otherwise in a court of law..."I wish you the best of luck." Having read the whole thread, I feel like I'm up to speed and I have an opinion that is no worse than yours....As I said before, the argument was changed midstream and now the gear is under attack rather than where the hook contacts the fish. Nothing changed. There has always been a direct relationship between a legally hooked fish and the gear used, right from the very first post. BTW, nobody said a plug was made to slide on a leader. It's tied on the end of a line, and includes the hooks. Yes, very similar to a jointed stickbait. As for the whirly thing, it's clearly stopped from sliding freely the entire length of the leader/line, which I believe is the argument. Says you under your own definitions and your own meanings. Bringing awareness to the legality here does not make me an "accuser" anymore than it makes my views "allegations." The beauty about not parsing the statute, like you have done, is that it leaves no reason to go to court. That trouble starts by justifying that "in the mouth" means "out of the mouth." Please show where I have "parsed the statute". (c) It is unlawful to intentionally snag or attempt to snag any fish in fresh water. Fish unintentionally hooked elsewhere than in the mouth must be released immediately. "Snag" means hook a fish elsewhere than in the mouth. (d) Beginning January 1, 2012, the use of footgear with absorbent felt or other fiber material on the soles is prohibited while sport fishing in fresh water. The 2" rule makes no mention or assumption of where the hook goes. I presume it relies on the snagging definition 5 AAC 75.022 "in the mouth" for that. Additionally, there is some background discussion on this regulation by the ADFG staff that says, "beads fished at a distance from the hook are purported to increase the incidence of “foul-hooking.” I assume "foul hooking" means a snagged fish. So clearly they are aware fish will get snagged. Yes, the 2 inch rule was created to stop people from putting the hook too far (more than two inches) from the attractor thus increasing the probability of snagging. The two inch rule was created to solve the problem of snagging but it still allows the hook to catch the fish with the barb of the hook outside the mouth while the rest of the hook was inside. That's how beading works and that's how flossing works. Those things are allowed so I can only assume that is the intent of the "in the mouth law" otherwise, we would have thousands of people every year and millions through the years blatantly breaking the law and hundreds of troopers allowing them to do it. It just doesn't make sense to me. I'm not sure of the 2" rule on the rig itself yet. But when I couple it with the method Doc is using - placing the hook well outside the mouth, flossing the line, and pinning the hook elsewhere than in the mouth, I conclude it is snagging. I'd feel better if the fish was actually taking the hook, rather than the opposite. The problem is, we allow it to happen the other way ( fish taking the attractor instead of the hook) an awful lot. You would need to reconcile your ideals with beading and flossing and other lures with just a trailing hook. If you could, take your two hands and close the mouths of Doc's fish. What's in and what's out. It doesn't really matter (to me) where the hook is in those pictures. What matters is where the hook was when the fish got hooked. It became very clear to me in talking to the troopers. If a portion of the hook (the shank) was inside the fishes mouth when the fish got hooked it's legal. Instead of just closing the fishes mouth, swing the hook around so that the shank is inside its mouth (if you can) then close the mouth. If you can do that, it satisfies the intent of the law, it's not in conflict with beading or flossing or any other lure that a fish might bite with a trailing hook (like the kwickfish) and that's the way the law is enforced. Forget that I was told by the head-honcho LEO that the intent of the statute was the fish must bite or take the hook and be hooked inside the mouth. Read all the other Pacific Coast state's regulations (I already posted them) - they too say this is illegal I personally don't care what the laws in other states say, I fish in Alaska, Honestly, I think if I had a chance to talk to Corkrell he might make the same allowances that all the other troopers I spoke to make (I could be wrong) If a portion of the hook was inside when the fish was hooked. I'm pretty sure I could demonstrate on all of the pictures that the Doc showed us (except one, I can't see clearly on that one) that a portion of the hook was inside the fishes mouth when it was hooked. What I'm afraid of, is the pictures he may not have showed us. I suspect there were some fish caught that had hooks embedded farther away from the mouth than the ones he showed us. The possibility certainly exists with a hang back of 8 to 10 inches. If the distance was shortened to say four inches, it would satisfy me that the fish caught were actually biting on his attractor and not just getting snagged for merely being close the lure. Just like a bead two inches from the hook does.